Do you know why Christianity is so divided? Where is God's truth being proclaimed? Human annihilation is nearer than we think! In a world torn by strife and hatred, man has devised several frightful ways by which he can destroy all living things! Year by year, this condition grows worse. What is the meaning of these times? U.S. President John F. Kennedy, in a speech before the United Nations, stated: "Mankind must put an end to war, or war will put an end to mankind.... Today, every inhabitant of this planet must contemplate the day when this planet may no longer be habitable.... Together we shall save our planet — or together we shall perish in its flames." U.S. President Ronald Reagan admitted, "There have been times in the past when people thought the end of the world was coming, and so forth, but never anything like this." Today's state of affairs clearly indicates that humans do not know the way to bring peace to the world. We are living in a so called "Christian" Western world. Yet it is a world cut off from God, groping in the dark, living under the constant threat of world suicide. Why has our Christianity failed to halt the mounting wave of personal problems among individuals — and international upheaval and violence among nations? Why do the organized church denominations have no real answer to these problems? Many are asking, "Has God forsaken us?" The answer is that we have forsaken God — far more than most of us even begin to realize. Nearly 2,000 years ago Jesus Christ came to this earth with a message from God the Father. He preached the good news of the Kingdom — or government — of God (Mark 1:14-15). He also came to found His Church. Jesus said, "I will build my church; and the gates of hell shall not prevail against it" (Matthew 16:18, Authorized Version). Notice that Jesus did not say "churches" but "church" — one Church. He called it a "little flock" (Luke 12:32). Jesus taught His followers to obey God's spiritual law contained in the Ten Commandments (Matthew 5:19). Setting an example of perfect obedience to God's laws, Jesus told His disciples to become perfect in character as is God Himself (verse 48). Be sure to read the article entitled "Are All Ten Commandments in Force Today?" beginning on page 14 of this issue. Later, Jesus warned His followers of ill-treatment and persecution by the world: "They will put you out of the synagogues; yes, the time is coming that whoever kills you will think that he offers God service" (John 16:2). What most people fail to realize is that the true servants of God were persecuted and killed down through the ages for preaching Christ's message. God's truth was never accepted by the world as a whole. Jesus warned, "If they kept My word [they crucified Him instead! ], they will keep yours also" (John 15:20). Rather than believing and obeying Christ's message, this world has persecuted His servants and His true Church down to this day. A startling change took place in Christianity soon after the deaths of the original apostles. Ancient pagan beliefs and practices were introduced into an apostate church, and God's truth was suppressed by clever argument and political pressure and, when necessary, by physical force. Notice the historian Wharey's comment: "Christianity began already to wear the garb of heathenism" (Church history, page 39). Hurlbut states: "The forms and ceremonies of paganism gradually crept into the worship. Some of the old heathen feasts became church festivals with change of name and worship" (The Story of the Christian Church, page 79). You should realize that these same false practices are still being observed by churches throughout the Christian world. 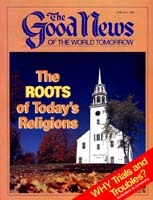 Describing the development of this system, the historian Hurlbut comments: "The church gradually usurped power over the state, and the result was not Christianity but a more or less corrupt hierarchy controlling the nations... making the church mainly a political machine" (The Story of the Christian Church, page 80). In spite of these startling admissions by church historians, most ministers still attempt to prove their historical descent from Christ and His apostles through this false system. Yet this apostate system had departed about as far from the teaching and practice of Jesus Christ and His apostles as it would seem possible to imagine! The historian Plummer directly acknowledges this fact: "And as soon as the revival of letters caused the contents of the New Testament and the teachings of the fathers to be known, it was seen that what passed for Christianity at the close of the 15th century was scarcely recognized as such, when placed side by side of what we know of Christianity at the close of the apostolic age" (The Continental Reformation, page 11). Remember that Jesus said, "I will build my church." In Ephesians 1:22 and other scriptures, Christ is described as the living Head of the true Church. Do you imagine that Jesus was the Head of a system that had utterly departed from almost every remnant of His true teaching and practice? Would He allow His faithful, commandment-keeping Church to descend into such a state? The early church reformers and their later followers completely failed to recapture the faith and practice of Jesus and His apostles. It seems that they found a few truths, only to introduce other peculiar errors of their own devising. And abundant historical records show how the early reformers cruelly persecuted those who disagreed with their teachings — even to the point of taking their lives. Perhaps the most basic reason why these teachers have not been able to understand the spiritual truths of the Bible, and to believe and practice the literal teachings of Jesus, is one false concept they have persistently maintained. These religious leaders knew that Jesus said He would build His Church, and that it would not perish. But they mistakenly felt that it would be a big, organized, denominational body, and jumped to the conclusion that the great counterfeit church ruling the nations must be the connecting link between them and Jesus. Therefore, much of their reasoning was based upon the early traditions and practices of that church, which they assumed to have been untainted by human reason. They continually looked to the "early fathers" for guidance on doctrinal questions. Thus these teachers have failed to restore the true message of Jesus Christ. They have only introduced more religious confusion than already existed. God labels the whole system "Babylon the great" — or great confusion (Revelation 18:2). Today's world, sad to say, remains in almost total ignorance of Christ's real message — of the purpose of God, of the laws of God, of the meaning of the prophesied events that are being rapidly fulfilled now. But could this fantastic, worldwide deception be possible? Could this be God's will? The Bible itself, believe it or not, prophesied this modern religious confusion. Jesus Christ warned that many false preachers would come in His name and would deceive the people with a false message. He said, "For many shall come in my name, saying, I am Christ; and shall deceive many" (Matthew 24:5, AV). Yes, hundreds of differing denominations have appropriated to themselves the name of Jesus Christ, but they have denied His message, and they have substituted paganism with its beliefs and practices for His way of life. And they have deceived the many — not the few. The apostle Paul was inspired to warn of this great falling away from the truth: "For the time will come when they will not endure sound doctrine, but according to their own desires, because they have itching ears, they will heap up for themselves teachers; and they will turn their ears away from the truth, and be turned aside to fables" (II Timothy 4:3-4). Paul knew that after his death and that of the other apostles, the false ministers would come in with all of their heathen practices, religious festivals and philosophies. He knew that the world would be turned from the truth to fables — fairy tales. He warned of men in the last days "having a form of godliness but denying its power. And from such people turn away!" (II Timothy 3:5). Paul knew that at the end of this age people would cease to recognize God as a power to be reckoned with in world affairs, and that they would deny His authority in their individual lives. The modern form of Christianity is a corrupted form inherited from ancient pagan mystery religions. On the outside of the package it is labeled "Christianity." But inside are contained the old pagan philosophies, traditions, heathen festivals, practices and false concepts of God and the way of God. Today's Christianity is totally different from the Christianity of Jesus Christ! Church historians admit this fact — seemingly oblivious to the tremendous import of what they are saying. Scholar Rufus Jones states: "If by any chance Christ Himself had been taken by His later followers as a model and a pattern of the new way, and a serious attempt had been made to set up His life and teaching as the standard and norm for the church, Christianity would have been something vastly different from what it became" (The Churches' Debt to Heretics, page 16). Dr. Jones recognizes that Jesus' kind of Christianity is not being practiced in our modern world today. Let us candidly inquire: What is wrong with Jesus' kind of Christianity? Did Jesus Christ know what Christianity ought to be like? Just who has the authority to set the standards for Christianity? The real answer to this dilemma is that Christ Himself prophesied that the world would be deceived by Satan the devil and his false ministers. We find Satan described as "that old serpent of old, called the Devil and Satan, who deceives the whole world" (Revelation 12:9). It seems hard to believe, but the Bible says this whole world has been deceived! Speaking of the Babylonish false religious system that developed during the Middle Ages, the apostle John says in Revelation, "The inhabitants of the world, were made drunk with the wine of her fornications" (Revelation 17:2). Because of this spiritual confusion — this spiritual drunkenness — most people today are not able to see spiritual truths clearly. They are like a drunken man with blurry vision when they try to read the Bible. It doesn't make sense. They get confused. They may ask their ministers — but usually only get an evasive answer or pretty platitude that doesn't really answer the deep spiritual question in their hearts. The Bible just doesn't seem to make sense to people. They don't understand it. They don't understand the theme in its laws and teachings, and they certainly don't understand its prophecies. Almighty God has permitted Satan the devil to implant his religion in the minds of people. He started doing that clear back at the Tower of Babel. He continued it through the ancient Chaldean mystery system developed by Nimrod and his harlot-wife, Semiramis. That system has spread over all the world, so that many of the same customs and practices of our Western Christianity today are found in varying forms among the Eastern religions and the idolators of many far-flung tropical islands. This same Chaldean mystery system — with its pagan philosophies, religious holidays and symbols — was brought in by stealth into many of the early Christian church congregations. Carnal minded church leaders promoted this system, which the natural mind of man seems to love so much. They pretended it was Christianity — and forced it into an apostate body they were beginning to develop out of those congregations and individuals who did not wish to keep intact the way and truth of God. Now, in this age, you have grown up supposing that all these churches are God's churches. You have probably thought, How can all these churches be wrong? They can be wrong, because God says, "For all the nations have drunk of the wine of the wrath of her fornication" (Revelation 18:3). Truly, Satan has deceived the whole world. The Bible means exactly what it says. Traditional Christianity is nothing more than the ancient Babylonian mystery religion! May God help you see this truth! You are not going to have long to debate about it, frankly, because we are nearing the end of this age of man going his own ways on earth. Jesus said, "I will build my church." He did not say many churches — but only indicated one Church — His Church! He called that Church a "little flock." He said they would be scattered and persecuted. Recall that in John 15:20, He said that most people would not keep to the truth of His Church or accept it any more than they had accepted Jesus' own teachings. And they crucified Jesus Christ. Remember that Jesus taught obedience to God's law based on the Ten Commandments (Matthew 5:17-9, 19:17). He told His servants to continue preaching that same message. Jesus commanded His servants to go into all nations, "teaching them to observe all things that I have commanded you" (Matthew 28:20). In His revelation to John, Christ described the last generation remnant of His Church as those people " who keep the commandments of God and have the testimony of Jesus Christ" (Revelation 12:17). He described His persecuted saints this way: "Here is the patience of the saints; here are those who keep the commandments of God and the faith of Jesus" (Revelation 14:12). If you want to know the truth — if you want to be protected from the cataclysmic times that lie just ahead — then you had better seek for and find that Church — the true Church of God — the only Church Jesus built — the Church of which He is the living Head! Has there been a small, scattered, persecuted Church that keeps all of God's commandments and that Jesus Christ is using today to preach His Gospel to the world? Yes. There has been and is. But first you need to prove this — and then you need to do something about it. The Bible identifies the true Church as those people "who keep the commandments of God" (Revelation 12:17). Another thing to bear in mind in regard to the true Church being scattered and persecuted is that you can't join that Church like you would some social club. In New Testament times, people were only considered members of God's Church after they had obeyed the inspired command: "Repent, and let every one of you be baptized in the name of Jesus Christ for the remission of sins; and you shall receive the gift of the Holy Spirit" (Acts 2:38). So you have to repent of your sins and of your self-willed way of life before God will put you into His Church. After repentance and baptism, you are to practice, as we have seen, obedience to God's law as a way of life. You are to live by every word of God and to follow the example and teaching of Jesus Christ. In addition, the true Church has the name God intended His Church to bear as one of its identifying signs. God's true Church was never named after some religious leader, or some particular doctrine, or some type of church government or method of doing things. The scriptural teaching shows that it was always named after God Himself! It is His Church. He owns it. He possesses it. He rules it through His Son Jesus Christ. Therefore, in 12 places in the New Testament it is called, "The Church of God." Another outstanding characteristic of God's Church is its willingness to admit error and to change. Each human is commanded to change — to grow in grace and in knowledge (II Peter 3:18). Since the Church is only the sum total of its members, it, too, must continually be willing to repent if God has permitted some error to creep in, and to grow in grace and knowledge. Therefore, the true Church will be a Church continually growing into new truth and knowledge and understanding. Its members will "hunger and thirst for righteousness" (Matthew 5:6). Because of this humble, repentant, yielded attitude, God's Church will be filled with love and zeal and a continually deeper understanding of God's will and of the meaning of Bible prophecies in relation to the times in which we live. These things are so because God's Church is yielded to and led by God's Spirit. Jesus said, "When he, the Spirit of truth, is come, he will guide you into all truth" (John 16:13, AV). Only God's true Church really has these characteristics. And therefore only God's true Church is filled with the knowledge, the understanding and the love of His Spirit. The true Church must be doing the work of God on earth today! It must be preaching Christ's true message — His commandments — His way of life. It must be preparing the way for God's Kingdom — or government — to come and rule this earth before man destroys himself. It must be warning the world of the coming punishments for its wicked ways. Do you know where to find that Church? We offer, free, several booklets that explain in much more detail how this world's religious confusion developed, where the true Church is today and what Bible prophecy says about the times we are living in. They are Your Awesome Future - How Religion Deceives You, Where Is The True Church? and Are We Living In the Last Days?. Scoffers will not have long to scoff! The prophesied events that this Church alone proclaims will soon be reality. There will be no reasoning or argument about it. You will see and feel these things happen. The reason God has allowed today's religious confusion is so that after 6,000 years of human misrule — bringing us now to the verge of world suicide — man might at last have enough of his own ways, his own political schemes, his own religious theories. After a time of great punishment that he has brought on himself, man will at last be really willing to learn of God's ways and laws, and to accept God's rule through Jesus Christ so the world can at last have peace. God's Church has never had many different names, doctrines and practices. God has only permitted this Babylon of religious confusion to develop so that man might be able, under Satan's deceiving influence, to try every conceivable type of religious theory he might lust after. This is so that man might — in plain language — once and for all "get his belly full" of the foolish ideas and reasonings of human, erring men. Then he will be willing to obey God! Now you know why there exists such religious confusion. Now you know which is the true Church of God! This is your life. May the Almighty give you an open mind to further prove and believe His truth. Pray for understanding, and for a willing heart. Be sure to obey the truth as you prove each point. This is the most important business of your life! The end of this age is very near!